Remember the shelf? Wooden thing, long and flat, held all your records, then your videos, then your DVDs and CDs. Streaming made the shelf redundant. But unless you live in the country with freshly installed Broadband your speed may be too slow to watch a movie. That’s why internet speeds are faster in Latvia and Estonia than they are in London and Texas. Their systems are newer. So to free up space you now store in the Cloud, which is what companies like Ultraviolet have been waiting for. The new Apple IoS update, Sierra, is busy telling everyone that their Cloud storage is now nearly full. It’s not. But if you put Cloud storage and Siri onto your devices, you’ll need to starting putting all of your intangibles – your movies, music and photos – into the Cloud. And that will cost you 79p a month minimum to begin with. The sliding scale starts here. I have two laptops, a main computer and a phone. They’re not all synced and I’ve never used Siri. I’ve turned off all the syncing and tend to dongle or mail work between devices, but as everything gets more complex I’m starting to confuse my updates, so I’ll probably need Cloud storage. Storage costs a bit, and will soon cost a bit more because your laptop is a piece of hardware that’s ageing daily, and cannot absorb ritzy new OSs that contain tons of stuff you’ll never ever use. I watch those Apple videos about all the wonderful things you can do now, like share your holiday memories with your cat, or send recipe photos to your washing machine, or change the colour of your tax returns, and soon you’ll be able to project emojis onto the moon or add voicemail to videos of Russian car accidents, and you’ll have no time left to think about why you upgraded at all. I know I am not the template for an average Apple user. I like movies that Netflix has never heard of (‘Tomorrow I Will Scald Myself With A Cup Of Tea’, the popular Turkish time-travel movie, anyone?) and music you can’t find on iTunes (The dance version of ‘Curse of the Werewolf’, bootleg, origin unknown). I don’t want to watch ‘Minions’ or ‘Transformers 10’. I need tangibles because there’s no other way to see ‘Combat Opera’ without pirating it. It doesn’t make me a Luddite but part of me wants my old shelf back. Tomorrow I will Scald Myself with a Cup of Tea is Czech isn’t it? Ken & Chris – you *are* joking, right? I use Dropbox, but not sure if it works on Apple. For photos, Google Photos is brilliant, and you can store an unlimited number of pictures in the cloud for free. Works on Android and Apple. I just finalized my will which has a clause giving my executor rights over all my digital devices, storage, websites, etc, so he/she can eliminate them. This post made me realize that’s a chore you shouldn’t wish for your worse enemy,. I think, sorry, hope, there are more of us not average Apple template users out here in the web world although I fear they are most likely to be characters of our generation. I have been a Mac user for quite some years now, not least because it manages to work without the time lag of the wonderful world of windows. But have recently been incensed by the new version of iTunes which has suddenly decided that i’m not allowed to burn to disc anything I have bought from them. Needless to say they no longer get my money…. Bring back choice and clear the shelf mother for the new CD’s..
P.S. admin. I do not believe your shelves ever looked like that..! John Howard: Under Playlists on left. Click on Purchased. Sort by clicking on album. Select 1st song, with Shift key down, select the last song. All songs should be selected. From File Menu: Select playlist from selection. Select playlist, from File Menu: Select burn playlist to disk. Never sell these. I have been getting more and more nervous about Apple over the last couple of years. I have used a Mac for over ten years upgrading only when desperate. I hate all those features you know your never going to use slowing up your machine when you upgrade to the latest OS. I really hate the new iTunes and go back to my old iBook where I still have a version of iTunes I understand to burn discs. There is far too much reliance on Cloud storage for my liking now. Thats where everything seems to be heading. A tech journalist was on the TV the other day saying the best way to hold on to you treasured memories, those being photos or music and film, is to keep your own back ups on drives that you own yourself and not to trust cloud storage where things could just be randomly wiped if a payment is delayed or fraudsters hack your account…. Yes I very much like my shelving here at home where they are all still full of Books and other tangible items. George, thanks very much for that. Will go and twiddle some menus. 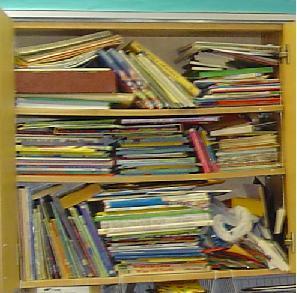 My shelves did indeed once look like that – it sort of crept up on me.